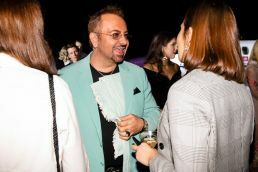 Napoleon Perdis Cosmetics has celebrated its official landing into Priceline Pharmacy, launching as the first prestige beauty brand in the Australian retail powerhouse. Known for his epic event arrivals, from army tanks to BMX bikes (just to name a few! ), Napoleon outdid himself with his most extravagant entrance yet. 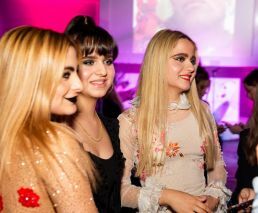 The Australian king of cosmetics arrived at the launch event on a private jet, joined of course by the rest of the Perdis clan: his wife Soula-Marie and daughters Lianna, Angelene, Alexia and Athina. Taking place inside an Airplane hangar in Brisbane, the event paid homage to the brand’s coveted Auto Pilot collection, showcasing Napoleon’s ‘landing’ into Priceline. Media, influencers and key stakeholders for the brands were able to view the line-up of Napoleon Perdis OG cult classic products, as well as newly developed exclusives now available at Priceline stores across Australia. Guests viewed and tested the products displayed on a beautified baggage carousel, sipped cocktails, and enjoyed food served out of an airplane food trolley (Napoleon Perdis x Priceline branded, of course), all while surrounded by high-end private jets, loud music and flashing lights. Not only did they leave with a Napoleon Perdis-filled goodie bag, but also had access to the amazing beauty vending machine. The customer has always been at the forefront of the Napoleon Perdis brand, and the roll-out into Priceline will to empower customers to be in control of their choices through a wider and more accessible selection of affordable, prestige beauty. “My commitment here tonight, standing before you all, is to relentlessly deliver exciting, accessible and trailblazing innovation for our Australian customer.” said Napoleon Perdis, Founder and Chief Creative Officer of Napoleon Perdis Cosmetics.